Last week, Microsoft has released an update that changes the operating system’s time zone change in certain countries. In the past, the time zone here in Israel would change in around the month of September. our ministry of the interior decided that it would change the time zone in October 27th, which forced Microsoft to release a new update – the last update was released in December 2012, and that update referred to the time zone shift in September, which isn’t relevant. I was assigned by the head of IT to write a script that checks if the update is installed on our Windows servers, and log the data in 2 files – the first, on which server it is installed, and on the second, on which servers it is not installed. Of course, I could have done it with a killer one liner, but I wrote a script, although quick and dirty, I thought folks could find it helpful, so feel free change it and adjust. ###use Get-Content with a text file that contains server names. Add-Content -Path C:\KB2863058.txt -Value "$(Get-Date)`t $server`t $($update.InstalledOn)"
The script creates 2 files. first is C:\KB2863058.txt, which contains all server names where the update was applied. the second, C:\KB2863058_FAILED.txt, contains all server names that wasn’t reached, or whether the update wasn’t applied. I could use PowerShell Remoting to query the servers in parallel, but WINRM is not enabled in most of them, and writing a workflow is a bit of an overkill for this kind of a task (on my opinion). Very sorry for my blog not being updated regularly, These past few months have been very busy with all source of thing in life. I’ve got to admit that my daily visitors count is growing steadily, which is very satisfying and I’m very thankful for, but I do need to provide more quality PowerShell content for these new readers. Comparing to other blogs that I follow, the rate that I’m updating my blog is very slow. I do like to say big thanks for all the readers, looking at the statistics and seeing the numbers grow and people clicking around and finding interest is very gratifying to me. I’m still learning a lot of new things in PowerShell, things that I found very useful on a daily basis, and I will share those with you. Look out for more frequent blog posts, with content that I hope you will find interesting. Like most IT tasks (when it comes to Microsoft’s products), this task can be automated with PowerShell. Personally, I like to use Microsoft’s ActiveDirectory PowerShell module for all PowerShell AD tasks. In order to retrieve Remote Desktop settings, the Classic “Get-ADUser -Identity SomeUser -Properties *” wont help us find properties with relevant info, because Get-ADUser can’t get them all. Another built-in solution is to use the old-fashioned ADSI adapter type. the .NET frameworks wraps the adapter like a PowerShell object. its accessible through the .psbase member set which let us access the objects public members. Not as friendly as a Cmdlet, but it will give us properties and methods to work with. 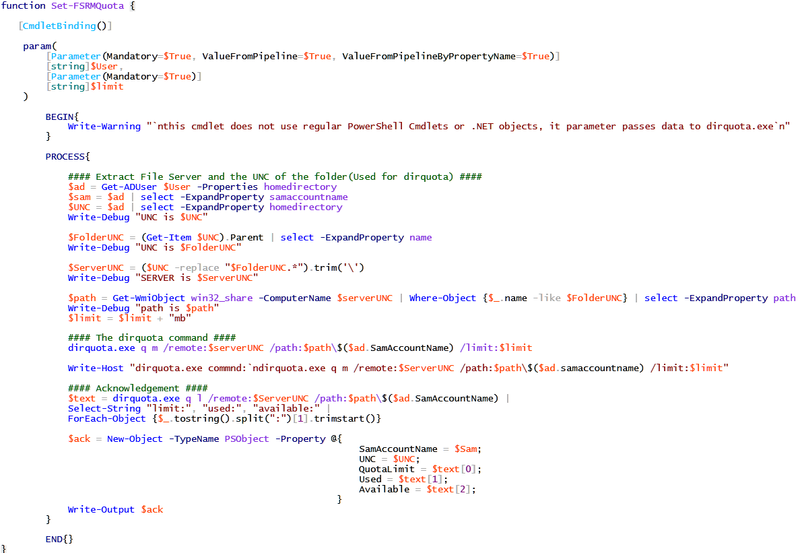 Next, I query the object received with its InvokeGet() method. Thats pretty useful, but how do I configure those attributes? similar to the last example, I use the InvokeSet() method. Do you find it helpful? I’ve been working with Windows 8 for a week or so on my laptop, and I’ve noticed something. While trying to start a PowerShell V2 host, I get a message that The .NET Framework Version 2 isn’t installed – a requirement for PowerShell V2 to work. You need to open an elevated Shell. You need to open a 64 bit command shell if you’re using a 64 bit Windows OS.